Noël Burch's singularly perceptive view of film and its origins will interest all who care about film theory and history. 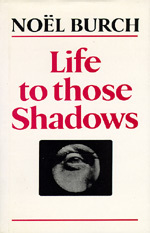 Life to Those Shadows presents a critique of "classical" approaches to film: the assumptions that what we call the language of film was a natural, organic development, and that it lay latent from the outset in the basic technology of the camera, waiting for the prescient pioneers to bring it into being. The view that film language was a universal, neutral medium, innocent of any social or historical meaning in itself, is also challenged here. Burch's major thesis is that, on the contrary, film language has a social and economic history, that it evolved in the way it did because of when and where it was constructed—in the capitalist and imperialist West between 1892 and 1929. From this perspective, the book examines the emergence of what it defines as cinema's Institutional Mode of Representation and the sociohistorical circumstances in which it took place. Central to the Institutional Mode are the principles of visualization—camera placement and movement, lighting, editing, mise-en-scène—that filmmakers and audiences came to internalize over the first three decades. Special emphasis is laid on the all-important change that occurred in the placing of the spectator, from a position of exteriority to the film image—implicit in both film-form and viewing conditions during the primitive era (pre-1909)—to the imaginary centering of the spectator-subject—completed only with the generalization of lip-synch sound after 1929. Burch contends that this imaginary centering of a sensorially isolated spectator is the keystone of the cinematic illusion of reality, still achieved today by the same means as it was sixty years ago. Noël Burch has exerted an important influence on film studies; he is the author of Theory of Film Practice and To the Distant Observer.